This troubleshooting article addresses some audio issues of the #Lenovo Vibe c a2020a40. Like any smartphone, the Lenovo Vibe c a2020a40 audio system can fail due to a lot of inside and outside factors. Today, we bring you three sound problems on this device so hopefully our suggestions will help fix your own issues as well. Remember, audio problems may have different circumstances but solutions for all of them don’t vary much. Hers’ a solution for Lenovo Vibe c a2020a40 if having an audio problem with earpiece or receiver speaker. This solution will make your troubleshooting easy and quick. Sometimes, it is easier to find a solution when you know where the problem lies. Without an idea of where the problem is, we may not be able to troubleshoot accurately and effectively. If the earpiece is not working or no sounds can be heard on it, you may first manually check the receiver speaker using a multimeter. If the speaker is damaged replace it. A poor, distorted or garbled sounds is also an indication of a bad speaker. If the speaker is okay clean the speaker terminal contact pads, ensure that it has properly or good connection between the speaker’s terminal. Check the filter components, such coils, and ESD diodes. 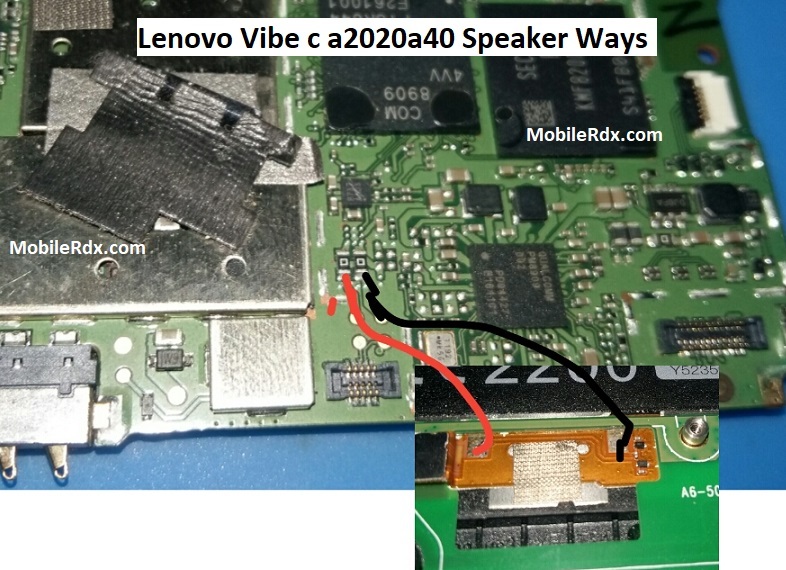 Lenovo Vibe c a2020a40I Speaker Ways, No Sound On-Ear Speaker, Earpiece Ways Jumper. The two terminals of the speaker from the connector are connected to the diode. Check the diode by using multimeter, if it is faulty then change it.